The progressive liver disease nonalcoholic steatohepatitis (NASH) is mediated by an innate immune response in the liver that causes tissue damage and fibrosis. The innate immune system protects against invading pathogens, but it’s not clear how it becomes activated in livers of patients with NASH. In the July issue of Gastroenterology, Kouichi Miura et al. describe an immune signaling pathway that controls the development of NASH in livers of mice. Miura et al. induced steatohepatitis in mice by feeding them a choline-deficient amino-acid–defined diet (CDAA). In patients with NASH, Kupffer cells (liver macrophages) produce inflammatory and fibrogenic factors that activate hepatic stellate cells (HSCs) to produce inflammatory cytokines such as interleukin (IL)-1b. What activates these Kupffer cells? Kupffer cells and other cells of the innate immune system express Toll-like receptors (TLRs), which recognize microbial structures and activate production of inflammatory cytokines. So, Miura et al. 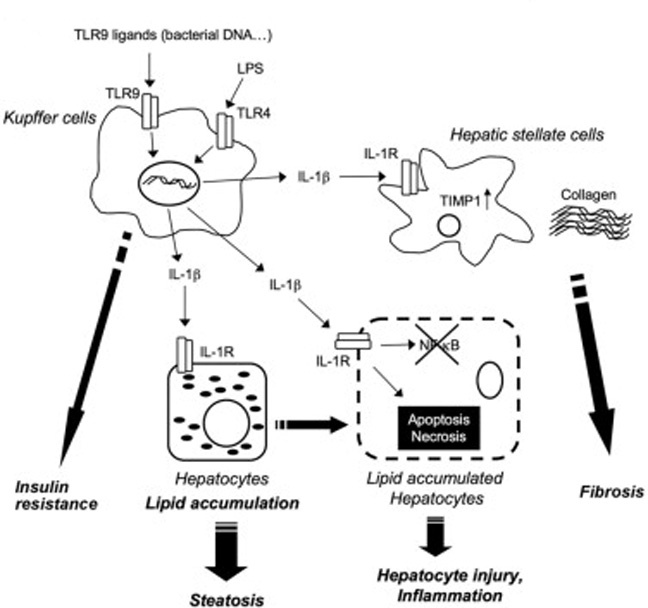 induced NASH in mice that that did not express a TLR that had been previously associated with liver injury­–TLR9­­­­, which recognizes bacterial DNA. The development of NASH through TLR9 and TLR4 on Kupffer cells. Livers of TLR9-null mice developed less steatosis, fibrosis, and inflammation than wild-type mice fed the CDAA diet, and Kupffer cells of the TLR9-null mice did not produce IL-1b. They found that Kupffer cell production of IL-1b promoted NASH by increasing lipid accumulation in hepatocytes and death of these liver cells; it also activated the fibrogenic response of HSCs. Mice that lacked the receptor for IL-1b (IL-1R) or had disruptions in other components of the IL-1R signaling pathway did not develop NASH. The IL-1 signaling pathway therefore mediates disease pathogenesis in these mice. Previous studies have shown that lipopolysaccharide (LPS), a gut bacteria-derived endotoxin that activates another TLR, TLR4, also induces Kupffer cell activity and can cause NASH. Further studies are needed to learn whether TLR4 and TLR9 have synergistic effects in NASH progression. In patients, Kupffer cells, as well as other liver cells, might encounter bacteria-derived components such as LPS and DNA, simultaneously or sequentially, to activated TLR4 and TLR9 on Kupffer cells and initiate the pathogenic process. Other liver cell types besides Kupffer cells are also probably involved in the pathogenesis of NASH, and it is not clear what ligands actually activate TLRs in patients with NASH. Bacterial DNA was detected in blood taken from mice on the CDAA diet, so DNA derived from gut bacteria might activate TLR9. TLR9 can also recognize DNA released from necrotic hepatocytes to activate liver inflammation and injury­—another potential pathway to NASH. What do you think? Leave your reply below using the “Leave a Comment” link. Miura K, Kodama Y, Inokuchi S, et al. Toll-like receptor 9 promotes steatohepatitis by induction of interleukin-1β in mice. Gastroenterology 2010;139: 323–334. Read the article online at Gastroenterology. This article has accompanying CME. Read the accompanying editorial: Gao B. Innate immunity and steatohepatitis: A critical role of another toll (TLR-9). Gastroenterology 2010;139: 27–30.